Iberia auctions seats on flight to NY, pulls out after becoming too successful! 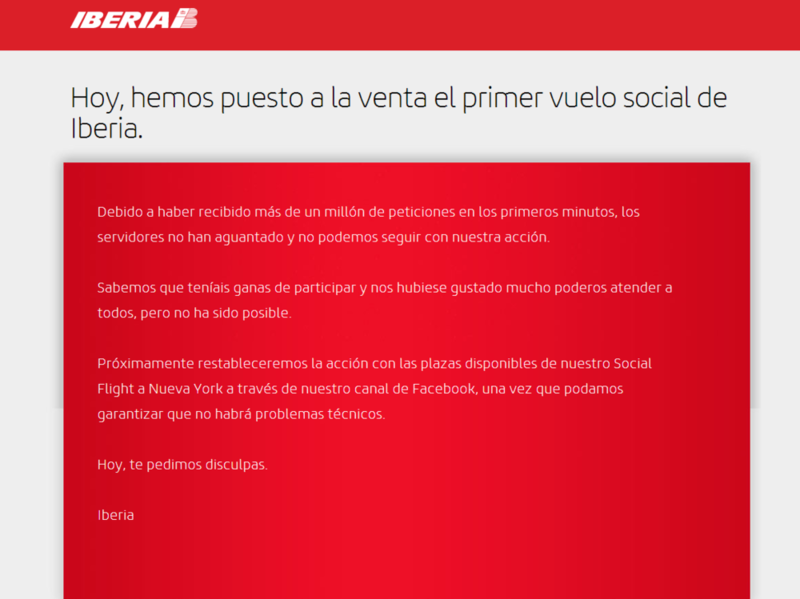 Yesterday evening Iberia launched its Social Flight campaign. The idea is simple, yet, very powerful: all the seats on a flight to New York (232 seats) go through a reverse auction, where prices go down every second until the plane fills up and all seats are sold. Prices on that flight, that will take place on 20th September, start at €600 euros, yet, they were going to go down €5 per second between 8pm and midnight, so the trick is to hold your offer until the price has gone down enough, but before all the seats are sold. Problem: the campaign was so popular that the IT system crashed and the campaign had to be halted and postponed, with all remaining unsold seats going to auction at a later (yet unspecified) date! Looks like it was not a totally unexpected outcome, as this article in El Pais was warning before the start of the action...nevertheless, a good lesson for all airline social media and marketing managers trying to do something similar!